Toronto neighbourhood associations are finding rewards in reaching across borders with the common purpose of solving urban issues. Gathering on the West Toronto Rail Path, from left, Bruce Gavin Ward, Liz Sutherland, Donna Cowan and Suhail Barot got together to develop a road safety program. Donna Cowan was appalled at the anger in the streets she witnessed when she started commuting on her electric bicycle a couple of summers ago. “It wasn’t car against bike only, it was car against car, bike against bike, walker against bike, everywhere,” she said. So Cowan did what she’s grown accustomed to doing since the neighbourhood association she leads, DIGIN, launched a little more than a decade ago: she reached out to other local groups. More and more neighbourhood associations like DIGIN — which is committed to the cultural, social, environmental and economic vitalization of the Bloor Street West neighbourhood around Bloordale — are breaking down boundaries and working together to strengthen their areas, Cowan said. She believes collaboration is a must if neighbourhood associations want to get anything done. “Your community doesn’t exist in a vacuum. Just because you have a border to your group doesn’t mean you cross the street and nothing’s happening,” she said. 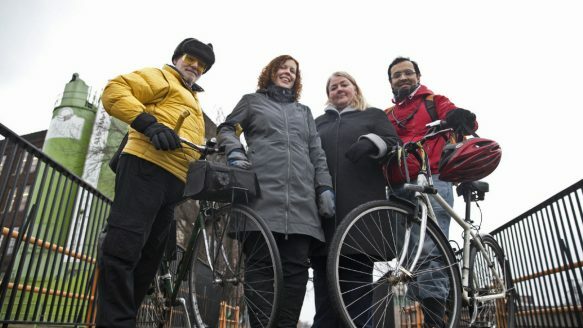 On Sunday, Cowan, representing DIGIN, met Liz Sutherland of Ward 15 Cycle Toronto; her Ward 18 counterpart, Suhail Barot; and Bruce Gavin Ward, from Friends of West Toronto Rail Path, to work on a street safety initiative aimed at boosting civility and respect among all people who use the road. People need to come together to improve an area, she said. DIGIN has had its successes. It was the group’s idea to launch the BIG on Bloor Festival, a bi-annual street festival aimed at getting people in the neighbourhood talking about how to develop their stretch of Bloor. “It brought together not only community residents’ associations but also social service agencies, the Bloordale Village BIA (Business Improvement Area), the Bloorcourt BIA, councillors, provincial and federal elected officials. From it, people are still talking; other collaborations are still going on. It was quite fruitful,” she said. Many community groups that neighbour DIGIN subscribe to her group’s email list to keep up to date, Cowan said. From left to right, Liz Sutherland, Donna Cowan, Bruce Gavin Ward and Suhail Barot pose for a photo Sunday on Dupont St. near the Toronto Railpath. New development is often a catalyst for community groups coming together, said Sue Dexter, a member of the Harbord Village Residents Association board. Harbord Village, she said, regularly collaborates with Grange Community Association and The Annex Residents Association, among many others. Dexter said Harbord Village has collaborated with other groups for at least a decade now, but the collaborations are happening more often lately. The change in thinking could be part of a resurgence in initiatives led by neighbourhood residents. In September, Paul Bain, a project manager in the city’s planning department, told the Star he has observed a “renaissance” of resident-led initiatives sprouting in neighbourhoods across Toronto. Ed Hore, co-chair of the York Quay Neighbourhood Association, said it’s been helpful to have the support of other groups as the YQNA deals with the issue of the island airport. So much more can be accomplished by working together and capitalizing on one another’s strengths, said Tony Bolla, who is both a board member of the Regal Heights Village BIA and the Toronto Association of Business Improvement Areas. Bolla, who also founded a community website building business, said the Internet facilitates increased collaboration. Communities across the province have contacted him asking for help to build a website of their own. The Danforth East Community Association has also spread its wings outside of Toronto through the association’s pop-up shop project, which aims to revitalize main streets by moving temporary stores into empty storefronts. The project has so far proven successful — the commercial vacancy rate on Danforth East has decreased from 17 per cent to nine per cent — and the team has shared information with communities within the city as well as Oshawa, Bruce County and New Tecumseth, said Gay Stephenson, one of the project’s leads. “The pop-up shop toolkit is available for any community to use for free and we can offer a workshop to help them get started,” Stephenson said in an email to the Star Sunday.